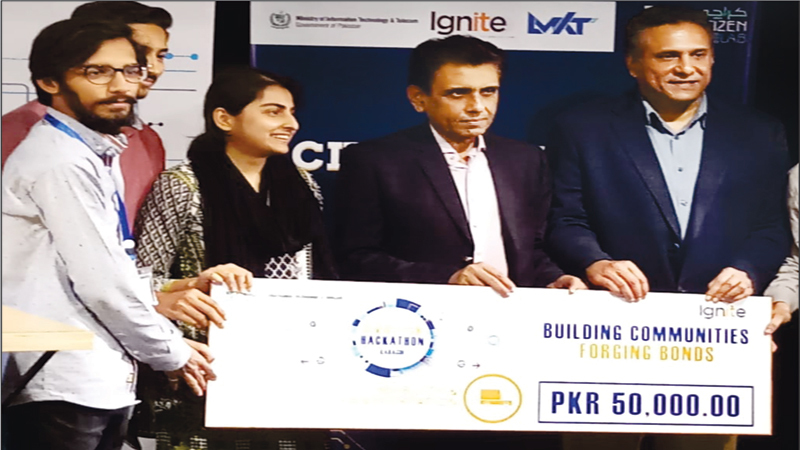 Ignite National Technology Fund by Ministry of Information Technology (IT) and Telecom organised a three-day Civic Tech Hackathon in a bid to come up with effective solutions to the problems of the city’s residents. Water access and quality, smart waste and sewage management, mobility and transportation, public safety and other citizen services were some of the fields focused on by the participants. The event was held in National Incubation Center from November 30 to December 2. Federal Minister for IT and Telecom Dr Khalid MaqboolSiddiqui was the chief guest of the prize distribution ceremony. The Minister congratulated Ignite – National Technology Fund and partner organisations for extending their support in putting together this platform to the youth for creating solutions to meet civic challenges that the megacity was facing. It is worth mentioning that Karachi, with a population of around 15 million, is the 9th largest city in the world. In terms of liveability, Karachi was ranked at 134th among 140 cities on Global Livability Index of Economist Intelligence Unit. The event brought together civic-minded IT professionals, software developers, designers and data analyststo innovate in public services by creating technology solutions to address the needs of fellow citizens. During the hackathon, the World Bank (WB) country head expressed interest in funding a couple of promising ideas alongside Nazim Central District RehanHashmi. Total prize money worth Rs300,000 was distributed among winners.